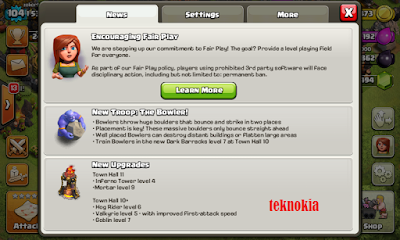 TEKNOKIA coc games news Supercell Will Permanently Ban of The COC "Cheaters"
Supercell Will Permanently Ban of The COC "Cheaters"
On April 18, 2016. at local time. Supercell staff was announced fair play policy of Clash of Clans games. This announcement has wrote on the Supercell official forum. Quoted from it, "As part of our Fair Play policy, players using prohibited 3rd party software will face disciplinary action, including but not limited to: permanent ban." Supercell has the goal to provide a level playing field for everyone. And consider “bot” and “mod” use cheating, and strongly encourage players to remove any aforementioned programs from their devices. By offering this warning, they hope to give all players a chance to enjoy their games the Fair way. For further details of fair policy you can clik this link. You can read the frequently answer question below quoted by the Supercell Forum. Q:Why did you initiate a mass ban? A:To keep our games safe and fair for everybody. Q:Why now? Hasn’t this been going on for a while? A:We’ve always taken action against players utilizing 3rd party software. Advances in tools have given us the chance to be more proactive than ever. We intend to do more in the future. Read Also : The Best War Attack TH9 August 2016 strategy "GoWiVaHo"
Q:What if I used Mods in the past, but not anymore? Will I be banned? A: Nope. Only accounts currently using 3rd party software will be affected. Q:Will everyone be banned at the same time? A: Not really. The Ban will roll out in stages. Q:How do you detect modified accounts? Q:What if someone’s banned accidentally? A:Our systems are robust, false positives may still be possible. We will swiftly reverse any mistakes made. Q: Will players with Jailbroken, or rooted devices be banned? Q:What if I use Bluestacks or other emulators? Will I be banned for that? A: No, but for practical support related purposes, we encourage you not to use them. Q:When will you be banning people? A: Bans will be ongoing, beginning in the coming weeks. Happy Clasher. Be Honestly !